Leading pub retailer and brewer Greene King has ordered another 20 customised drays from Ryder, a leading independent provider of commercial vehicle contract hire, rental, and maintenance in the UK. The 26t 6x2 DAF CF rigids are mounted on three-axle chassis with day cabs and Don-Bur bodies, and are customised to ensure that the cargo floor is at dray drivers’ waist height rather than at chest height. Some of the new drays appear in a new livery that celebrates Greene King’s latest brewery-conditioned beer: East Coast IPA, crafted with American hops. Scottish high street retailer Semichem has refleeted with Ryder. Semichem, a modern retailer specialising in health and beauty products, has been a well-known brand in the towns and cities of Scotland and Northern Ireland for more than 30 years. It has taken on two Daf CF410 6x2 tractors with Space Cabs and AS Tronic gearboxes, and four Daf CF250 18-tonners with 28 foot-long Bevan box bodies and Ratcliff 1.5t column tail lifts. Ryder, a leading independent provider of commercial vehicle contract hire, rental, and maintenance in the UK, and Bridgestone, the world’s largest tyre manufacturer, have renewed their industry-leading strategic partnership, ensuring Ryder customers continue to benefit from operational and cost improvements via industry-leading tyre performance and best practice in tyre husbandry. Ryder is supplying four new latest specification Mercedes-Benz Actros 1843 Prime Mover Drawbar rigid trucks, with Streamspace 2.3m sleeper cabs and demountable bodies, to Herman Miller Limited. Ryder is also supplying eight box trailers and two MAN TGX tractor units, converted from rental to lease, together with a Kalmar yard tug, to the international office furniture manufacturer. Ryder, a leading independent provider of commercial vehicle contract hire, rental, and maintenance in the UK, has crowned Jim Ryan ‘Top Technician’ in its annual UK Top Tech competition. 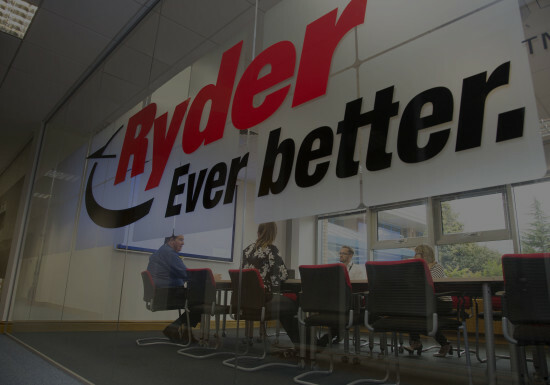 Now in its second year, the award recognises and celebrates the expertise of the Ryder Technicians in the UK, 100 of whom entered this year’s competition. After two tough rounds of online evaluations, a total of six Technicians made it through to the Grand Final. Ryder, a leading independent provider of commercial vehicle contract hire, rental, and maintenance in the UK, has named Glasgow technician Chad Johnston as its ‘Apprentice of the Programme’ for 2018. Ryder has supplied a DAF LF230FA 18 tonne skip lorry to metal recycling merchant Walter Heselwood. The family-run business operates in and around Sheffield and South Yorkshire, specialising in the delivery and collection of iron, steel, non-ferrous and special metals to and from engineering businesses and other organisations. All the materials are processed for recycling providing a financial benefit to the suppliers. Number 2 Mechanical Transport Squadron at RAF Wittering and Ryder in the UK have joined forces to celebrate the Royal Air Force’s 100th anniversary by wrapping two trucks in a commemorative livery. 2MT, as the Squadron is known, is the RAF’s road-going heavy lift capability. 2MT was originally founded during the Battle of Britain to transport vital spares between RAF Stations. Today, the Squadron provides specialist military drivers and equipment to support exercises and operations. Ryder technician Kieran Leyland has been selected to join 21 other elite, skilled apprentices from England, Scotland, Northern Ireland, and Wales to represent the UK at Europe’s most prestigious skills competition. Team UK will head to the EuroSkills Finals in September to compete in a broad spectrum of disciplines from web design to construction, cooking to engineering, and in Kieran’s category – heavy truck maintenance.